← environmental history of golden gate park? a spicy spin through the park? 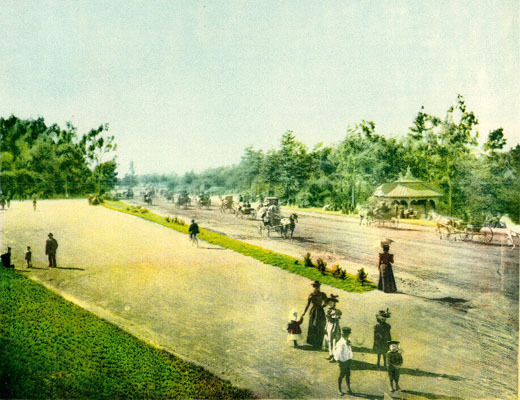 In My Park Book, published in 1898, Annie Nathan Meyer gleefully recorded the joys of spinning through Central Park, New York on her bicycle in the latter part of the nineteenth century. Among the pioneers of women’s cycling, she learned to ride in Central Park, deriving great satisfaction from “the spice and freedom [of] doing something in the face of society’s frown.” Having “invented a perfectly satisfactory wheeling costume, made over from a discarded skirt,” she enjoyed on long spins through the park with her husband, prominent New York physician Alfred Meyer. They often chose to ride in the early morning hours “before the advent of the watering cart” and “the parade,” i.e. the throngs of well-dressed folk strolling along the park’s paths later in the day, some of whom viewed bicycling as an unladylike pursuit. 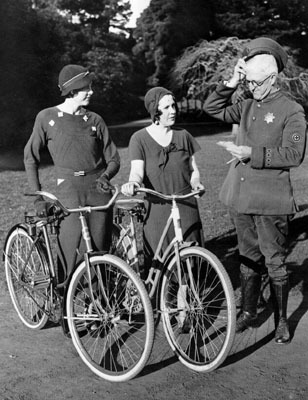 Golden Gate Park, 1933: "Miss Sally Emerson and Miss Jean Williams question Park Policeman Arthur Dolan as to why he arrested them"
This entry was posted in history, people, recreation. Bookmark the permalink. 3 Responses to a spicy spin through the park? What a wonderfully delightful post! This is charming… bicycles were evidently an important element of the trafficscape even 70 years ago. What a fun post and a great photo.